Yesterday was a wake up call for the bulls. Unfortunately it’s only going to get worse. The fact is that no matter what verbal interventions Central Banks or the political elite issue, liquidity is now rapidly leaving the financial system. The Fed continues to drain $50 billion in liquidity via its QT program every month. The ECB is no longer engaged in QE, which means it too is now draining liquidity as bonds on its balance sheet come due. This leaves the Bank of Japan, which is running out of assets to buy, resulting in it not being able to expand its QE program (the one that has been running since 2013). Finally, China is attempting to launch its own version of a QE program, though given the insane leverage in its financial system (the country is issuing $25 in new debt for every $1 in GDP growth) this will have little effect. Bottomline: for the first time since 2007, Central Banks are NET draining liquidity rather than adding it. No matter how you spin this, it means stocks are on borrowed time. 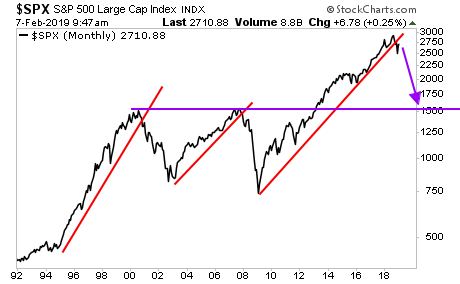 Indeed, we’ve broken the bull market trendline from the 2009 lows. The ultimate downside for this collapse is at best 2,000, and more likely than not we’ll go to the high 1,000s (think 1,750-1,800).